Set up in our little library, this 48-inch round table is dressed in a full-length black linen that is topped with a piece of wonderfully soft and washable black, brown & white plaid fleece from Hobby Lobby. The fleece tablecloth conveys warmth, while the plaid pattern reminds me of the flannel shirts guys often wear under their camouflage jackets. 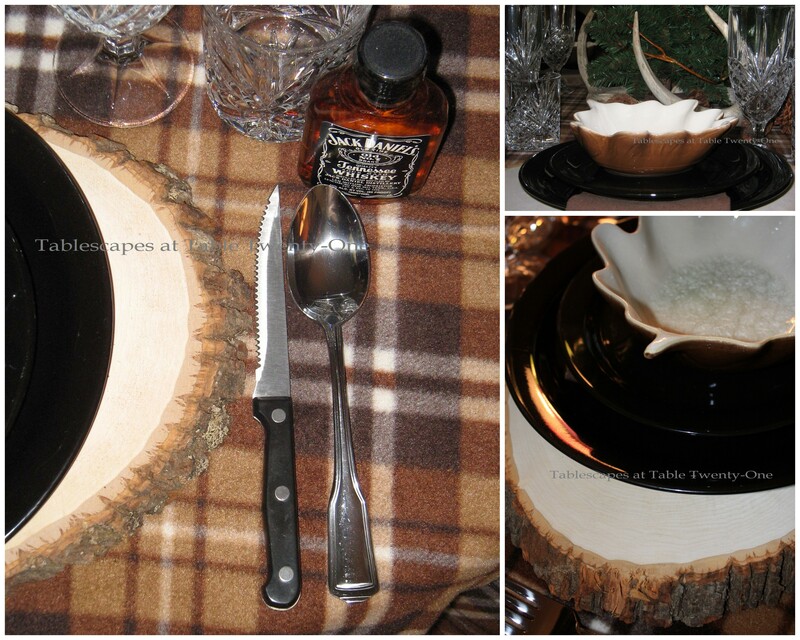 Each place setting starts with a wood slice charger. These wood slices are sold in the woodworking section at places like Hobby Lobby and Michael’s for about $10 apiece (but use those valuable 40% and 50% off coupons to save $$$! ), and they really work well with outdoor themes or rustic tablescapes. Every slice is a little different, and that’s what makes it really cool! The oblong shape allows more of the beautiful wood to show under a round or square plate. I used black ceramic plates – a combo of Dollar Tree and Target – to complement the masculine black under linen. A brown leaf-shaped bowl from Pier 1 is perfect for a little venison stew or rib-stickin’ chili. Hampton Silversmith’s “Patriot” flatware has a substantial shape and weight for the masculine hand. 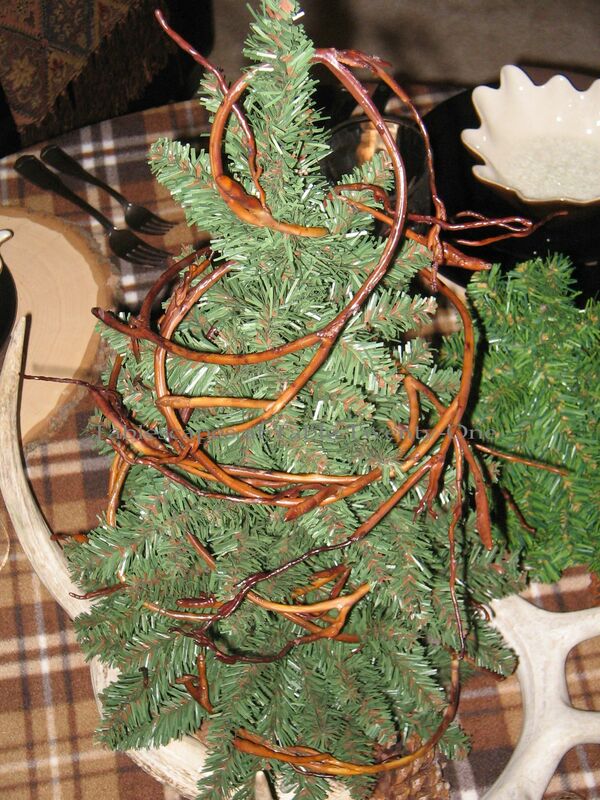 Men tend not to favor a lot of fussiness, so I used a miniature evergreen tree and simply adorned it with this stuff I found that looks kind of like twiggy barbed wire…if that makes any sense at all. It was just enough on the tree to lend a rugged, wintry feel without making it look too Christmas-y. 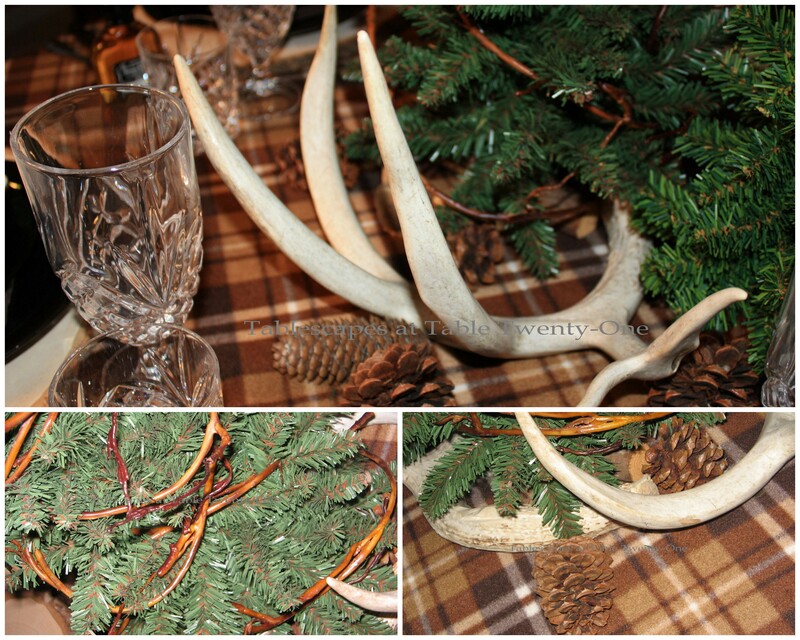 The base of the tree is finished off with (naturally shed) antlers and a smattering of pine cones. No votives or candlesticks here. Guys don’t care that the amber flame is flattering to their skin tone, and they sure aren’t lookin’ for romance around this table! 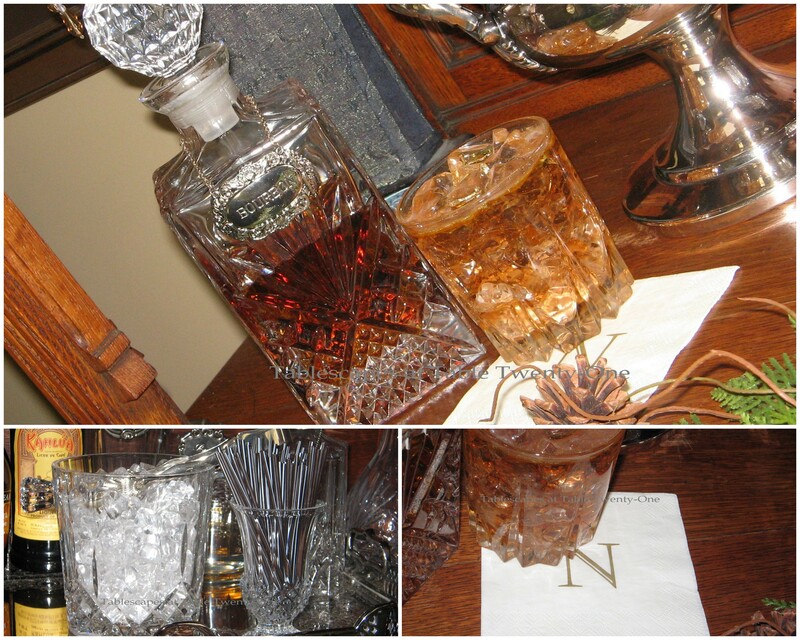 The vitrine in the library is a perfect place to set up bar for refills. 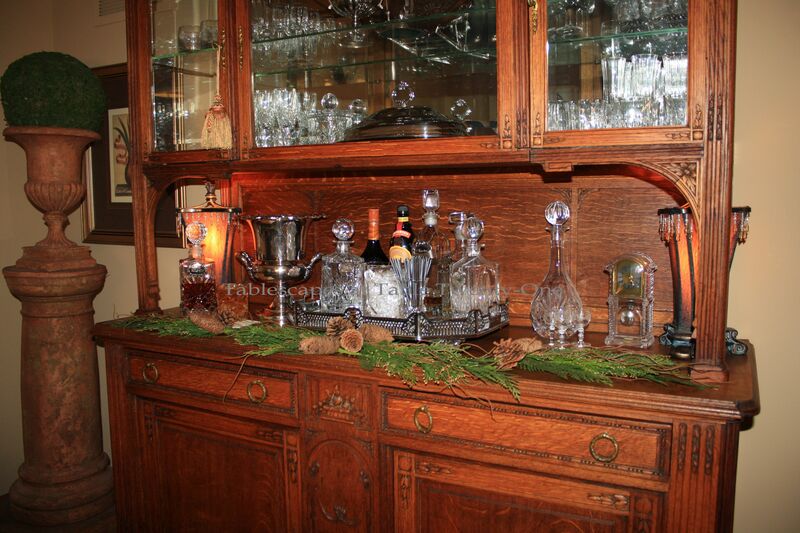 The deck of the vitrine is very humbly decorated with pine boughs. 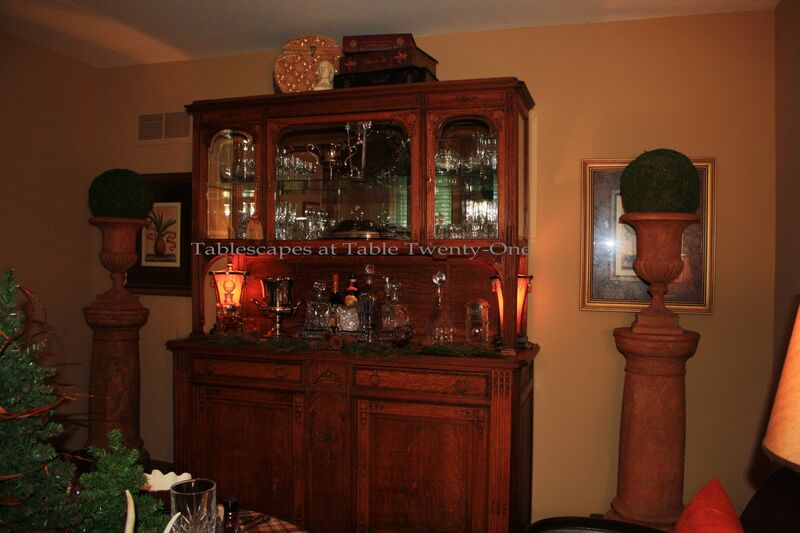 The urns on either side of the vitrine are topped with huge moss balls for a decidedly pared down masculine look. On top of the secretary on the wall opposite the vitrine is this great find from a few years back. There is no way an actual deer head was coming into this house!!! 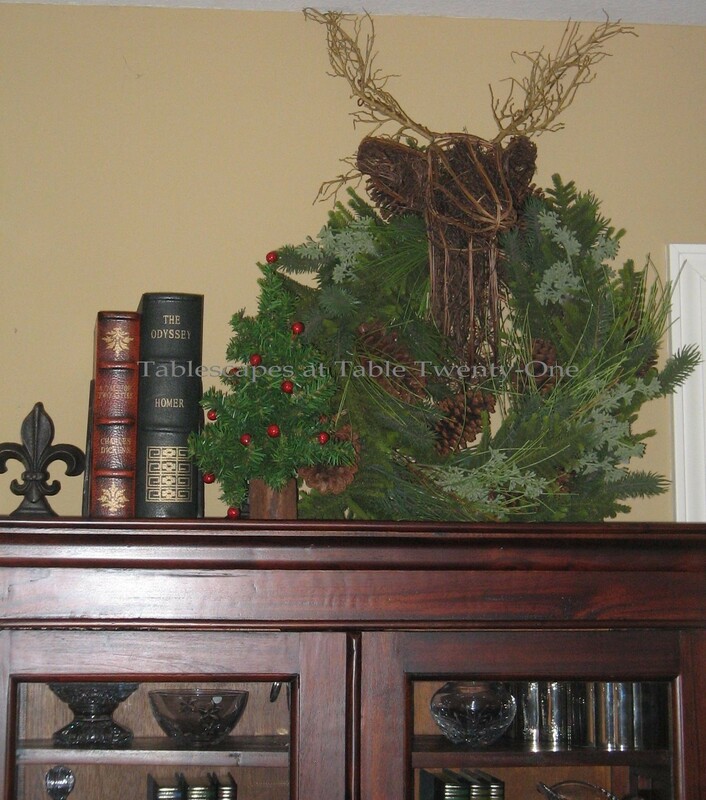 This grapevine deer head wreath, however, is perfect for the occasion and lends a sort of lodge look to the room. 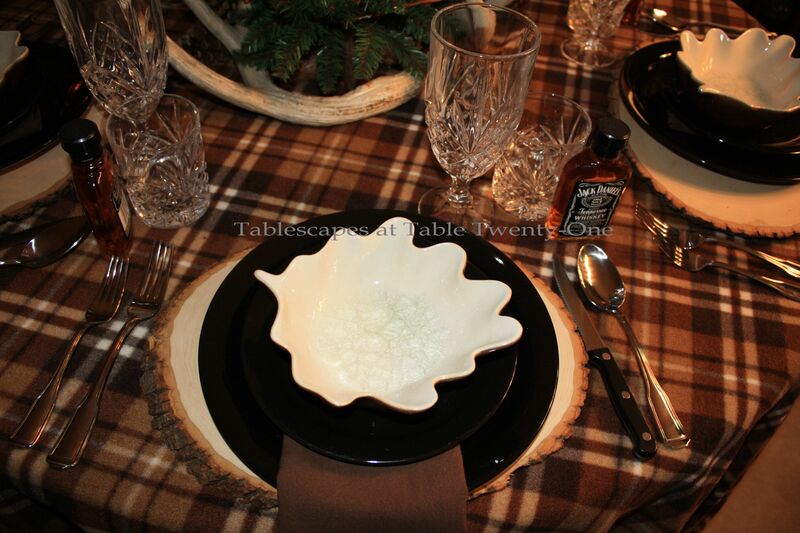 To see 9 more winter tablescapes on this site, visit the “Winter” page. Many, many, many thanks to fellow blogger/super sweetheart Cuisine Kathleen for the wonderful T.J. Maxx/Home Goods gift certificate I won on her site a couple of weeks ago! I am hoarding it for later use at after-Christmas sales. I’ll let you know what I buy! Join me as I visit Cuisine Kathleen for “Let’s Dish!” on Wednesday anytime after 6:00 p.m. CST, the Style Sisters for “Centerpiece Wednesday“, and Susan for “Tablescape Thursday” anytime after 9:00 a.m. CST on Thursday! Wonderful job Alycia! I love the whole concept you dreamt up. This look would fit in up north here just fine! The tree is cute- love the woody vine treatment and the antlers! You are right about the weighty drinkware adding to the rugged feeling- I like those wood sliced pieces too- perfect accent! The deer head/wreath piece looks awesome! Great job teach!! A lot of the men in my family would have loved this! You do such a great job with an idea, and carrying it through in the whole surrounding. Hope you are feeling better? Alycia, this table is just perfect for deer season or any hunting season. Love it. The heavy cut crystal really goes well with the manliness of it all. I, too, think the deer head wreath is great. Send me that link for the chargers…please. Such a wonderful settings, especially for the Gents. They all love Whiskey and Bourbon. 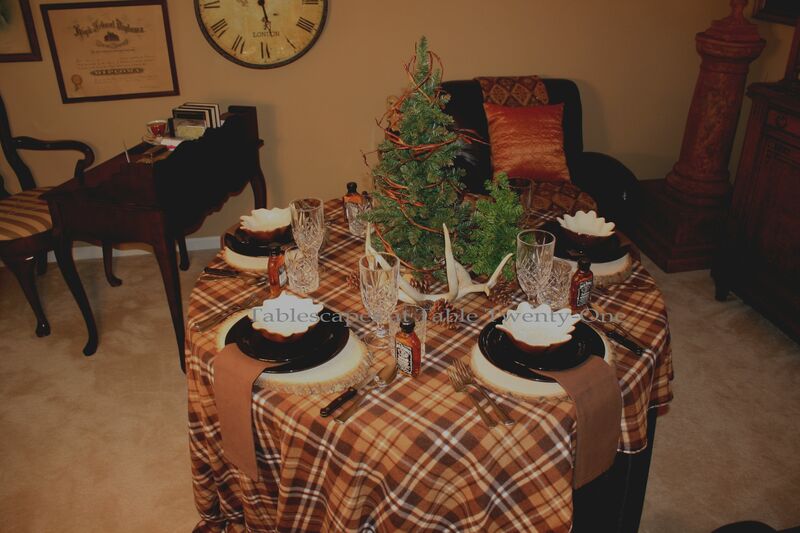 The tablecloth is perfection , along with the wood slices and antlers. How rustic and perfect for the man today. 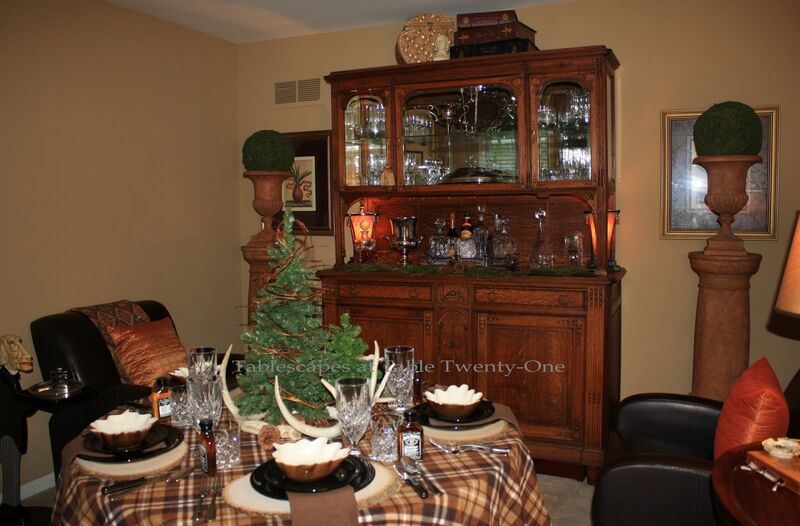 Love the deer head with the wreath dressing. Any man would feel comfortable sitting there. Anyway… great job Alycia! Love it all! This is one of my favorite tablescapes ! I’m a fan of the rustic. I would be interested in some of the wood chargers. Please let me know how to get in touch with the lady who has some for sale. There will be some deer hunting going on around my place this week-end ! Thanks for sharing ! Alycia, I just love it. I would love to have this as a woman’s winter retreat too! 😉 Love the rustic natural theme! I. Love. This. Table. Love it! Love it! Love it! The Jack Daniels sends it over the top!!! 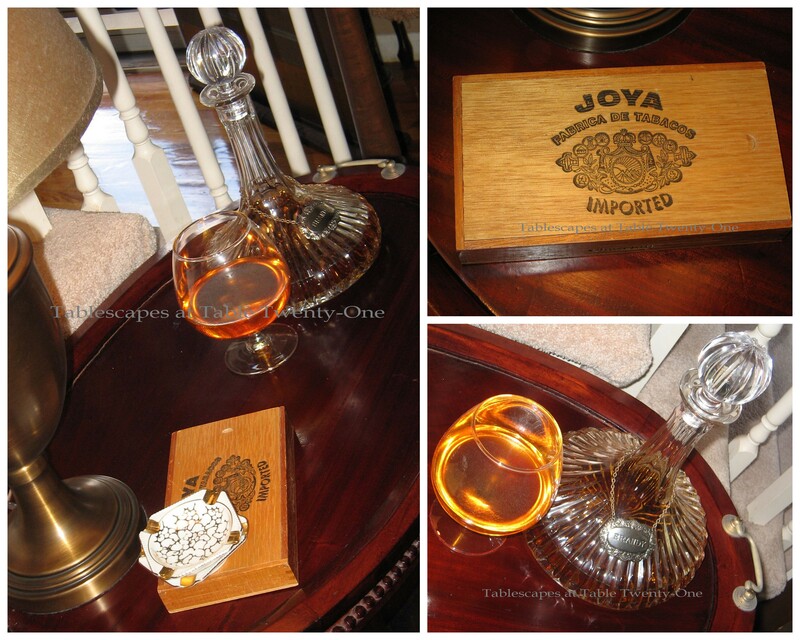 Oh hon, that JD bottle is what got me, lol..A gorgeous table, so simple and yet with so much class and elegance. I love the tree and the antlers as fabulous elements and with the plaid, just reminded me of some high lands in England or Irland! Now the wood slice chargers are awesome! The dear with the wreath I spotted up there in your buffet-hutch is exquisite..wish I had that style. Great dishes too. I’m with you FABBY! That Jack Daniel bottle set the stage for a good night toddy around the fireside. I’ll have a shot of that Jack Daniel in a cup of coffee to help me catch up on my lost sleep. Deer Season opened one week after we were married in 1983. That is the reason were married the 5th of November. Jim was in the woods on the 12th. Oh Alycia, I LOVE this table. My hubby would be wild over it! I know it’s a manly design, but I would feel comfy in this setting. I guess I love the woodsy feel to it. Please send info on the chargers. I have an elongated one, but I love these round ones. As always, your design is perfection! You always slay me with that little something unexpected. Here it’s the Jack Daniels which is so manly and a perfect accompaniment for the cigars which I hope the gentlemen smoke outside. Your students have to leave your class with their mouths hanging open at all the ideas you present. What a girl! I am with you Alycia! I would much rather hunt dishes and I would rather buy my meat to eat off those dishes, but I do know lots of hunters and they love their meat too. What fun touches. I know lots of men who would feel like kings if this table were set for them. You are always so fun and creative. What a great creative table you’ve set for the gentlemen, Alycia! I love the deer antlers, and the greenery–I think the guys who got to sit at this table would be very lucky 🙂 It was so nice to hear from you today–hope the post helps if you decide to give paperwhites a go. I’ve been on the run lately with a variety of projects, but it’s good to be busy with things I enjoy doing. I hope you have a fantastic rest of the week! Wow, you made me sit up and take note when I saw that bottle of Jack’s on your table!! What a fabulous idea to use the fleecy fabric as a tabletopper…but we all know you are full of great ideas! Just perfect as usual. Thanks for stopping by and giving me a laugh! You had me at the plaid. I love the rustic look of this one. Those glasses (which I think I have as well) are elegant while still being hearty. I love the antlers and greens on the table instead of flowers and candles too. I grinned about the amber tones on the face. Men don’t like candles all that much, do they? This was perfect. So warm and inviting. Have you had Jack Daniel’s Tennessee Honey? Yummo! By the way, I read your comment on Yvonne’s blog and could not agree with you more. I wrote a post last night about Chris Matthews’ insensitive comment about hurricane Sandy. What is wrong with people? Love the thumbnail pic you chose! My husband, son, and son-in-law would even click on it, and they are not particularly interested in tablescapes! What a great table, full of wonderful rustic textures — love the plaid topper, too. The wood slice chargers are incredible! I know you had a blast putting this table together. I wish I lived close enough to take one of your classes. I wouldn’t heckle — much. Downton Abbey? Biltmore? No, it’s Alycia!!! Wow, this looks like something from a BBC production and I KNOW my gentleman would love it! Very dapper indeed! I love masculine themed tables and you hit this one over the fence, sore shoulder and all. The Jack was the perfect addition. I adore your table. It encompasses all of the things that I am into right now! 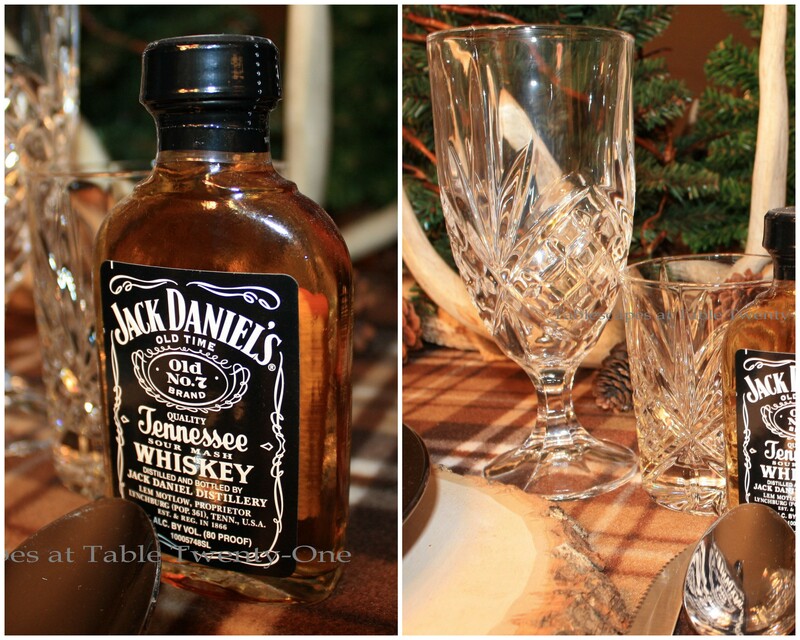 Plaid, antlers, wood chargers and Jack Daniels! Well, substitute a glass of vino please. I am VERY interested in the wood chargers! Email me the info if you could. I have been looking for these but alas, unwilling to pay the steep prices. Great job Alycia as alway. It is masculine..it is bold. Love the woody touch. Warm and inviting setting with gorgeous brown/black colors. An elegant-rustic table. Your table is gorgeous…so warm and welcoming. I love that Jack made an appearance! Those chargers are really neat…so is your centerpiece. What can i say it’s all been said. Picture perfect, Should be in gentlemen’s mag. A very nice table — it’s a perfect men’s table! I love your Gentleman’s Table!!! You are so creative! Please send me the information on purchasing the chargers. They are for unique. Thanks! That looks so manly! I love the plaid, and you carried out the theme beautifully! I have a pic of a wood slice charger saved on my computer for years, always waiting for the next tree we have to take down! I would love the info, thanks you. Your table looks like it is from a gentlemen club, just wonderful. I love the hunt theme, and this looks fantastic. I also have quite a penchant for antlers (don’t ask me why). Very nice!